Eric Ravilious (1903 - 1942) worked as a painter and designer producing water-colours, woodcuts, book illustrations, ceramics (notably for Wedgwood), furniture, glassware and murals. He worked as an official war artist, but sadly failed to return from an air-sea rescue mission in September of 1942. 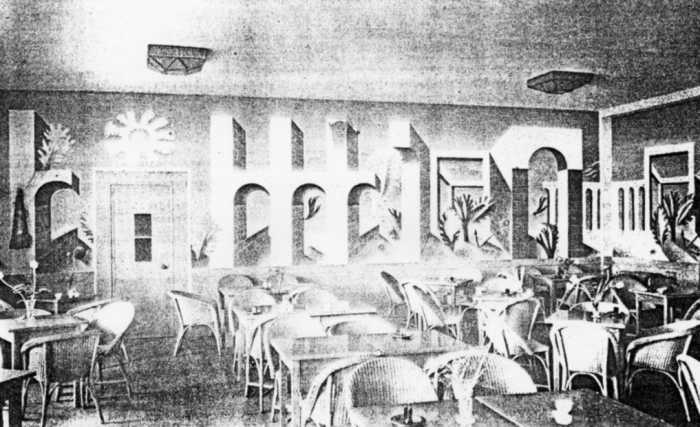 He painted murals in the Tea Room of the Pavilion, and possibly some designs for the Ballroom and Bar too. These murals survive underneath the later cladding, plaster and layers of paint. They are the only known surviving examples of Ravilious murals, and as such are of national importance. Photographed in 1934, exploratoray work in 2004 revealed the mural is intact beneath layers oflater wallpaper plaster and paint. "Eric painted all around the stage with marine subjects, shells, seaweed etc. I know that my father was very pleased with his design, he said that Eric had understood what was wanted and had an architectural sensitivity. The people at Colwyn Bay for whom we were working, had booked Eric and me into a hotel, which turned out to be a sort of holiday home hotel, where parties from Lancashire came for the week - there was a turnaround on Saturday - it was all very matey and lively in a North Country way, with a social host to liven it up in the evenings. I remember Eric and I had a table to ourselves (we must have seemed fish out of water) and we were greatly amused by our fellow guests. I know I thought Eric excruciatingly funny at times and very good company; and of course then, as now, I greatly admired his work." There was a large exhibition a few years ago at the Imperial War Museum of Ravilious's work, and there is a permanent collection at the Towner Art Gallery, Eastbourne. Further details are on the above website.